In my world, there’s not much that trumps tiramisu. I’m a self-proclaimed coffee nut to begin with, and have yet to meet a caffeine infused dessert that I’ve not loved. 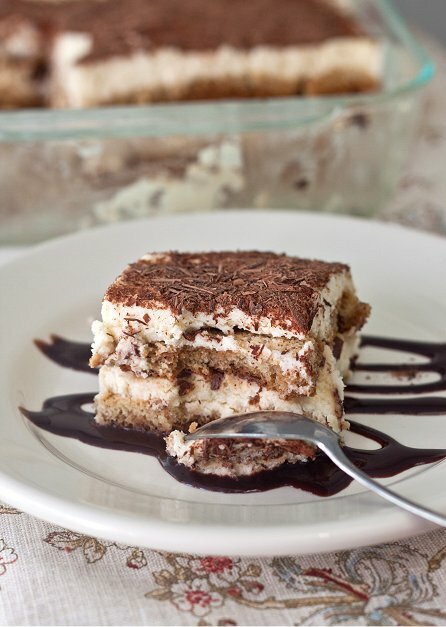 But, I’m particularly fond of tiramisu because it’s so easy. A couple rounds of layering espresso soaked ladyfingers and sweetened marscarpone cheese, and you’re done. The hardest part is waiting a few hours to let the flavors mingle. Don’t be thrown off by the addition of cognac. It’s optional, but it gives it a nice boozy hint that cuts some of the richness. If you’re staying in for Valentine’s Day this year, make this for your “special someone”. We usually avoid the crowds on the big night, opting to stay home instead with a heart-shaped meatloaf. Sounds strange, I know, but it’s something I’ve always looked forward to on Valentine’s Day since I was a little girl. I love that I’m able to pass on that silly family tradition to our boys. However, I think this adult dessert might be on the menu after the boys get tucked in. I hope everyone has a Happy Valentine’s Day! In a large bowl, whisk together the marscarpone, sugar, and cognac until smooth. In a chilled bowl, with chilled beaters, whip the cream until soft peaks form. Fold the cream into the marscarpone mixture. Lightly dip half of the ladyfingers in the espresso and arrange them in a single later in the bottom of an 8-inch square pan. Spread half the marscarpone mixture over the ladyfingers. Sprinkle with half the chocolate. Dip the remaining ladyfingers in the espresso. Top with remaining marscarpone mixture, spreading it smooth. Sprinkle with the remaining chocolate. Cover with plastic wrap. Refrigerate for several hours, or overnight, before serving. This looks so delicious!! WHat a gorgeous photo. I would have to agree, tiramisu rocks my world! 🙂 My mom makes it all the time and we’ve talked about having ‘tiramisu school’ for me and a friend b/c we want to learn how to make it! Your photo looks amazing, and the Sopranos cookbooks are some of my favorites! I’m bookmarking this, it looks like the classic version I crave. The heart shaped meatloaf sounds pretty good, too! The booze is completely optional. You could use brandy or coffee liquor as well, if you happened to have those handy.